The US anti-sweatshop organizing in the 1990s focused a great deal of individual corporations and their exploitation of workers in countries around the world. Organizers around the world however, didn’t just challenge the practices of individual corporations, instead they saw the larger structural exploitation that was taking place because of neoliberal capitalism. Organizers in countries that were being exploited saw the relationship between US imperialism, the global financial institutions (IMF, World Bank and the WTO) and white supremacy, thus articulating an analysis that went beyond brands like Nike and Disney. The analysis that insurgent groups in Latin American, African and parts of Asia began to use the language of globalization when referring to the economic system that was transferring wealth from former colonial countries to the US and Europe. This analysis was also being put into action in the form of resistance around the world and eventually came to Seattle in 1999, with the protest/direct action against the WTO meetings that were being held. The direct action shut down the meeting for part of the time and for the first time, people in the US saw what insurgent movements around the globe already knew, that resistance to globalization was possible. After Seattle, these kinds of mass demonstrations began to follow the WTO, the IMF, the World Bank and any regional trade policy discussions. In the Spring of 2000, there was an action planned in Washington DC, while local groups were also planning their own actions. In Grand Rapids, an anti-globalization movement also planned an action that would coincide with what was happening in DC. 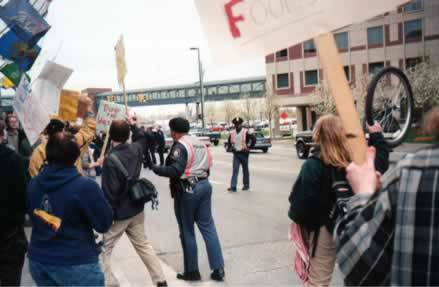 People from grassroots autonomous groups, organized labor, environmentalists and others planned and participated in the April 2000 action in Grand Rapids. The action consisted of three parts, beginning with a rally on Calder Plaza, which featured numerous speakers, as was documented in the 11 minutes video by Media Mouse. After the rally, roughly 100 people took part in an un-permitted march that went south on Division, west on Fulton and right on Monroe. The march took over the streets and the GRPD quickly showed up and demanded that people walk on the sidewalks. Police began pushing people towards the sidewalk on Fulton Street near the arena, but weren’t able to get everyone off the road until in turn north on Monroe. Police continued to harass protestors and several were arrested. You can see the GRPD pushing people towards the sidewalk in this photo on the right. The Grand Rapids Press reported on the action, with an article we are reposting below. 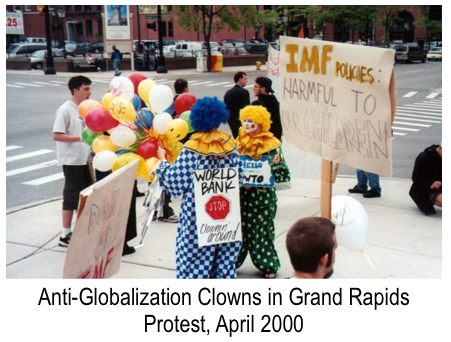 These kind of actions would continue in Grand Rapids for a few more years and at times people from Grand Rapids would travel to participate in other mass protests that confronted globalization. 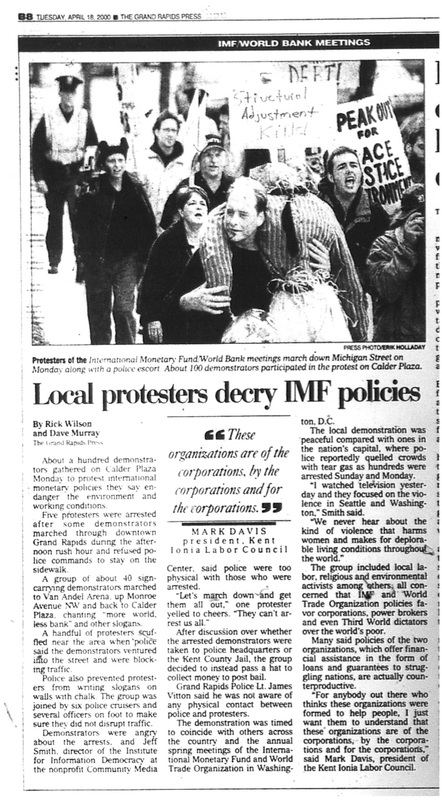 This entry was posted in Anti-Capitalism/Labor and tagged anti-globalization movement in Grand Rapids, April 2000 World Bank/IMF protest in Grand Rapids, protestors arrested in Grand Rapids. Bookmark the permalink.